When you go clothes shopping, you pick garments that are the size, fit and fabric for you. However, mattresses are no different. We’ve seen hundreds of reviews for the best mattresses out there, but how do you go about finding the right mattress for you? Today, we’re covering the best mattresses for heavy people in 2019. People come in all shapes and sizes. Therefore, a 60 year old woman is going to need a different type of mattress to a 35 year old man. For heavier people, lots of mattresses will be just too soft. At first, this will cause minor sinking but later down the line the mattress will sag. A sagging mattress can be a nightmare and cause all kinds of problems with temperature and comfort. Being heavier doesn’t necessarily mean being overweight. A 150llb person can be overweight and a 250llb person who is tall or muscular wouldn’t be classed as overweight. For that reason, we’re looking exclusively at mattresses that support weights of at least 200llbs. So, if you’re looking for the best mattress for heavy people out there, here are four of our top picks for heavier sleepers. In a rush? Then check out the Nectar Mattress. 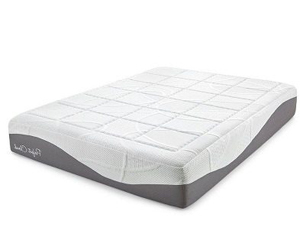 Made from outstanding materials and providing superb comfort and support, this mattress gives you great value for money and a fantastic night’s sleep. That’s why we recommend it as our number 1 choice for heavier sleepers. Here are the latest reviews of the 4 best mattresses for heavy and large people. Nectar sleep is a clever brand that has no traditional brick and mortar stores. Therefore, shopping is done online which allows them to keep their prices low without compromising on quality. We like this brand because they offer a lifetime warranty on all their products as well as free delivery within the US.So, why is this a good mattress for heavy couples or individual sleepers? Well, it all starts with layering. This mattress is built from a stunning 5 separate layers. Also, what’s particular impressive for overweight people are the thick adaptive hi-core adaptive foam layer as well as the solid memory foam base. Therefore, we think this is a most comfortable memory foam mattress for heavy people. Hi-core adaptive foam tends to be more expensive than other types of memory foam. The reason for that is the density and its ability to adapt shape quickly to changes in sleeping position during the night. Combined with the supporting base, this provides a firm mattress that won’t lose its shape or sag over-time; an ideal mattress for big and tall people. The other key aspect of a mattress for heavy people we identified was air-circulation. During the night our bodies are less capable of regulating temperatures and this can can disturb our sleep. Furthermore, this is especially true for big people who carry more body mass and therefore release more heat. So, Nectar Sleep has devised two methods to help deal with these problems. The first is an upper layer made of Tencel fabric which wicks heat away from the body. The second is a quilted gel lining that promotes airflow throughout the night. Both these aspects combine to deliver sleeping surface that is exceptionally cool and has the firmness and support of a regular memory foam mattress. Overall, we consider this is the best bed for heavy people. The construction and materials are durable and long-lasting whilst a real effort has been made to promote airflow during the night. 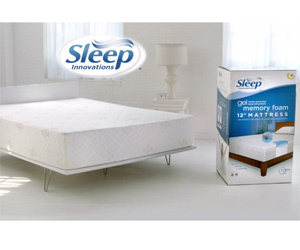 Sleep Innovation is a mattress brand that has been operating for a solid 20 years. As their name suggests, all their products are meticulously researched to deliver comfort and support. 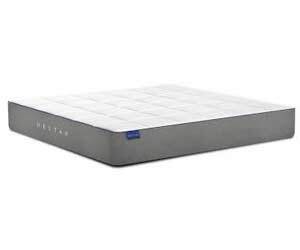 Also, the design that is tailored to the needs of their customers.Unlike Sleep Nectar’s one-size-fits-all approach to mattress building, the Shiloh series is specifically designed as a mattress for large people weighing over 200 pounds. Therefore, this is another great memory foam mattress for heavy people. The first thing that stands out about the Shiloh series is the thickness. A luxurious 9.5 inches of premium support is built into each mattress and offers a firm feel that resists sinking. Also, on top of that is a further 2.5 inches of deep sleep sure temp memory foam. Sure temp memory foam is designed to help reduce excessive heat during the night but it is still classed as a ‘neutral’ mattress on the heat scale. However, it doesn’t perform as well as gel-based alternatives. So, if you’re a hot sleeper, it may be worth considering something else. One of the things we really liked about this mattress was the level of support it offers. Whether you’re a side, stomach or back sleeper the foam base is quick to adapt delivering a firm, yet comfortable push back. Push-back is important because it helps your body to maintain its natural posture when you’re lying flat. This is especially important in heavier sleepers who will sink more into the mattress. Also, this makes this ideal for overweight side sleepers. The only downside we could find was the temperature during the night. The memory foam layer is designed to promote air-flow but the lack of gel layer means that it is not as cool as some of the other mattresses on our list. The decision facing buyers is whether the increased firmness and support is worth the higher temperatures during the night. So, if you’re used to waking up in a sweat then it’s likely you’ll need an extra cool mattress and would be better off opting for a Sleep Nectar mattress. Perfect Cloud has a reputation for delivering premium mattresses. They are a little on the expensive side, however you can expect this mattresses to feature the latest in sleeping technology. Furthermore, what sets this brand apart is the ability to order bespoke mattresses for overweight or heavy people.There’s no one for all approach here and customers have a choice of thicknesses, technologies and sizes. The elegance series is slightly firmer than their other offerings but has the type of advanced design we’d expect to find at this price point. In terms of luxury, you won’t do better than the Elegance series. The upper layer is a 1 inch thick piece of sumptuous HD memory foam. Below that is another 1.5 inches of memory foam and a 2 inch thick layer of gel memory foam. The base is a sturdy 7.5 inches of solid foam, therefore it delivers an impressive firmness. This mattress makes the cut because of its commitment to keeping for heavier people cool during the night. The HD and Gel layers all help to promote a healthy airflow. Also, this series features Perfect Cloud’s mesh gusset technology. Furthermore, it has a premium fiber weave that helps to transfer air away from the mattress during the night. If you’re an overweight or heavy person who regularly wakes up in a sweat then it’s worth investing more on an extra-cool mattress. Therefore, the Perfect Cloud Elegance series fits the bill offering one of the coolest memory foam sleeping environments we’ve found. It’s also a comfortable firmness which will help to support your back, neck and shoulders after a hard day’s work. There’s always something nice about a family owned company competing with the big boys in a corporate industry. Dreamfoam, the company who produce these mattresses, is exactly that. Using an online, direct from factory model to keep costs down, the US-based team are delivering mattresses with seriously good quality comfort and support. Therefore, this makes this mattress and excellent bed for big people. The design of this mattress is a little bit underwhelming it has to be said. Using a thick support foam for the base the mattress is supplemented with a gel layer and an extra layer of supporting foam at the top. There’s not a huge amount to get excited by, but it does stack up well-considering price. In many ways, we’d happily compare this mattress with something like the Cloud Supreme. It offers a similar material construction and price but, importantly, is available for a fraction of the retail price. We’d regard this as an excellent value mattress which perhaps lacks the sophistication of some of the other mattresses we’ve covered today. How To Choose a Right Mattress for Heavy People? When we talk about materials, we’re talking about the covers. Cover materials are an important factor when choosing a mattress for obese people or for those with a higher body weight. Micro-ventilated bamboo covers are commonplace in today’s market and provide excellent aeration. Oetko-tex woven fabric is another smart choice for a cover. You’ll want to avoid polyester which tends to retain heat. With many products, good reputations are earned. Mattresses are no different. Therefore, look out for brands or styles that have a huge amount of confirmed customer reviews. Tempur-pedic are one of the leading US brands so you can trust them to deliver. Make sure you’re looking at a best-selling mattress that is suitable for big people. Some popular mattresses will be too thin, too hot or just too uncomfortable for a heavier person. Find the brands, then cross check the specs with the advice given here. The online rating system is not always accurate. Also, some brands even employ people to fill out ratings for them. However, that doesn’t mean you get a good idea of a mattress from confirmed customer reviews. So, when you’re checking ratings for any mattress start from the bottom (1 star) and work your way to the top (5 star). This will give you a decent idea of the flaws of a mattress as well as its good points. Another alternative is to check out independent review sites. Cnet and Consumer Choice always offer honest opinions. Also, they don’t receive funding from third-parties, so you can trust them to deliver an unbiased review on any product. If, like many of us, you’re on a budget then price will be a big factor when choosing a mattress. So, work out you budget before you start looking and stick to it. However, as a heavier person you will have to invest more. That’s because beds for heavy people need to be thicker, plusher and extremely well-made. So, cutting corners on price will leave you with an uncomfortable mattress. You can find great value by looking at sales prices or opting for a smaller size such as queen instead of king. Compare specs between brands, and if they’re roughly the same then opt for the cheaper version. For a heavier person you should be looking to invest between $500 and a $1,000 on a good, long-lasting mattress. Thickness is an important aspect to get right. A mattress for an overweight person or a heavier individual will need to be thick in order to give proper support. Thick mattresses are 7 inches or above and deliver premium quality. However, the thicker a mattress is, the more expensive it will be. You can shop in the upper end of the medium range provided you choose the right material. A 6” thick memory foam mattress for heavy people with a high-density core will offer enough comfort. However, on an innerspring mattress you should be looking at the coil count rather than the thickness. 200 to 250 coils are the ideal number in a bed for heavy adults. Know that as time goes on, your mattress will soften. Therefore, it’s better to invest a little more in a mattress that will last for 10 years than invest less and only get 5 years usage. Feel like you need more information? Take a look at our in-depth article on mattress thickness. Good edge support increases the durability of the mattress and helps it to keep its shape. This is especially important as heavier sleepers need a heavy duty mattress. Also, if you enjoy sitting on the side of your bed to watch films or socialise, firm edges will be all the more important. Heavier people usually have a higher body temperature than lighter people. So it makes sense that breathability should be your number one concern when it comes to finding the right mattress. Breathable fabrics include bamboo, latex or gel based memory foam. Look out for these when you’re conducting your research. Your body is less effective at regulating your temperature during sleeping hours. You can invest in advanced technology to help maintain a certain temperature, or set your thermostat during the night to maintain the optimal 26 degrees. In terms of mattress what you’re looking for is ventilation. Therefore, honey-comb designs, inner-springs or latex all have better ventilation than memory foam. If you’re shopping in-store, always ask what kind of ventilation is on offer. Why Edge Support is Important for Heavier People? A mattress carries out more functions than just sleeping on. Also, many people will use their bed as a place to sit as well as for amorous activities. For everything other than sleeping, edge support matters because it keeps the mattress in shape and makes it more versatile. 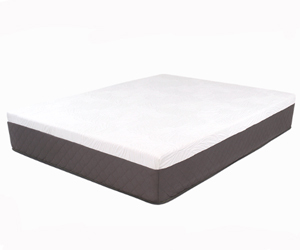 This provides a heavy duty mattress, making the mattress an ideal bed for heavy adults. We’ve recommended memory foam mattresses in our list above. The reason for that is they provide better support than traditional spring coil designs. Spring coil and hybrid mattresses tend to be better than memory foam when it comes to edge support. That’s due to the properties of each design and is difficult to adjust. We all need something a little different to make the most of our sleeping hours. Furthermore, getting a proper night’s sleep reduces stress, improves mood and helps to alleviate aches or pains. Therefore, finding better sleep starts with investing in the right mattress. As a heavier person you’ll have different requirements. You need something firmer with better ventilation to truly make the most of your sleeping hours. So, follow the guide above to find the perfect mattress and start catching those elusive ZZZs. There are three main types of material for a mattress: latex, memory foam or inner-springs. If you don’t know what memory foam is by now, then you must’ve been sleeping under a rock. The hi-tech fabric works wonders with back and neck aches because it adapts to the contours of your body.It’s not the ideal choice for heavier sleepers because it retains a lot of heat, especially if you naturally sleep on your stomach. However, if you are set on memory foam, then get a memory foam mattress that is multi-layered with gel or specially designed air-ventilation. These make more cool and comfortable mattresses for larger people. Latex is a popular choice among heavier people because its breathable. Sleeping hot during the night is not just a matter of discomfort but also leads to poor sleep cycles and a lack of rest overall. Latex is a natural material, it adapts to support your weight and helps to circulate air ensuring you sleep cool. These are the archetypal mattress and are usually composed of a fluffy layer above a bunch of coiled springs. Heavier sleepers should go for the orthopedically designed coil mattresses. These will have more than 200 coils and deliver a firm sleeping surface. The downside is that a heavier body will wear the springs out faster. Therefore, you should invest in individually wrapped coils or S-shaped coils to prevent that from happening. Coil spring mattresses circulate air better than any other material so you’re sure to have a cool night’s sleep. If you follow these guidelines, then an innerspring mattress can be ideal for obese people or heavier individuals. The best sleeping position for you will be the one that you’re most comfortable with. However, some sleeping positions will be better than others for things like back, neck and head support. If you’re above 200llbs the muscles in your lower back have to work harder to keep your spine in alignment. It’s also easier for your shoulders to sag forwards causing neck aches. Therefore, the best sleeping position tends to be on your side. This allows your body to maintain its natural curvature whilst simultaneously opening up your airways to make breathing easier. If you can’t be comfortable in any position but on your back, don’t worry. We’d recommend investing in an additional lumber support to help keep your spine in alignment. However, if you want to experiment with a quick fix, try placing a pillow under your legs to prop them up a bit and take the weight off your lower back. Stomach sleepers are less likely to snore but can also have issues with neck and back pains. These issues will only be made worse for those who weigh over 200llbs. This is because sleeping on your stomach puts unnecessary pressure on your spine. You’ll also have your head turned to the side which works your neck muscles. Sleep experts recommend that stomach sleepers at least attempt to adapt their sleeping position to a side position. If you really have trouble sleeping on your side or back, then invest in a firm mattress which will prevent you sinking during the night.